Northern Ireland's Rory McIlroy raised hopes of a repeat of his 2010 victory at the Wells Fargo Championship with a third-round 65 at Quail Hollow. Having made the cut with a shot to spare, just as he did four years ago, McIlroy found his form on day three to move to six under par. But he remains seven shots adrift of leader JB Holmes, who shot a 66. Martin Flores is a shot off the lead, with Phil Mickelson third on 11 under after a 63, and Justin Rose nine under. Rose carded a one-under 71 to sit in a tie for fifth place. 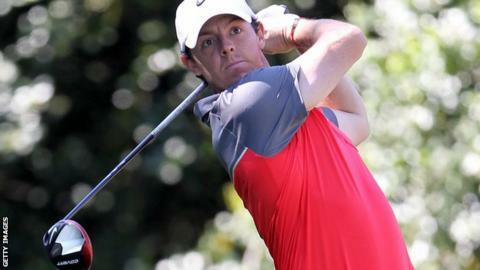 Ryder Cup team-mate McIlroy carded eight birdies and a single bogey to climb through the field. A 65 was one shot better than his third round in 2010, when he finished with a course-record 62 on the final day to take victory. The 24-year-old acknowledged it would take "something special" for him to repeat the feat four years on. He said: "I didn't hit as many loose shots as yesterday. I played solid tee to greens, but the real difference was the putting."